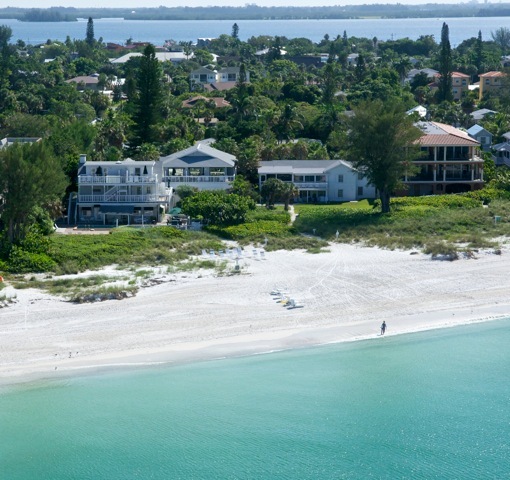 Located directly on the beaches of the Gulf of Mexico, sits one of the largest three story structures that has graced the shores of Anna Maria Island since 1925. Nestled among the tall pine trees and Florida foliage, this home was built of coquina-block shell walls and pecky cypress wood for floors, ceilings and doors. Several families called this beach house their home – among them Max Ingham, a prominent mayor of Holmes Beach, one of the small cities on the 7½ mile island. Rumor was that Lily Dache, the much talented millinery leader of custom hat making from New York City, stayed in the house. Others say Max Ingham’s wife loved hats so much that it was a collection that any store would have been proud to display. Another resident was the Socolof family. Mr. Socolof was a well-known ichthyologist and supplied many pet stores with tropical fish. His wife was a writer and wrote much about the habits and diets of animals. Dr. and Mrs. Owen McCarthy, residents from Bradenton, had the home as their beach house and enjoyed good times here for several years prior to our purchase. The walls of this home certainly hold many memories of happy times over the years. In the past, the only way to get to the island was to travel back and forth from the mainland of Tampa and St. Petersburg by ferry or from the Bradenton area across the rickety wooden bridge. In 1988, while walking the beach, Frank Davis spotted this charming piece of property and judged it to have much potential as a Bed & Breakfast. Work began, and in only a few months, Frank and other family members had turned that beautiful 4,000 square foot home into a B&B. Named after Frank’s father, the Harrington House opened on February 1, 1989. The Davis family looked forward to greeting many smiling guests with great anticipation of the comforts of the Bed & Breakfast experience. For over 28 years, Harrington House Beachfront Bed & Breakfast has welcomed guests from all over the United States along with many international travelers. “Come as a guest, leave as friend” is a sign gracing the walkway entering our main door. We hope that this holds true for you. We also hope that your experience here exceeds your expectation. Comfort, casualness, beach browsing, relaxing and just enjoying the Bed & Breakfast atmosphere is what we hope for you. Come, be our guest and friend.